Sinn Féin TD Pearse Doherty produced a series of emails from Apple executives to the Secretary General of the Department of Finance at an Oireachtas sub-committee meeting today. QUESTIONS HAVE BEEN asked about Apple’s relationship with the Department of Finance after a TD produced a series of emails from the tech company at an Oireachtas committee meeting. In the emails, the top civil servant in the Department of Finance suggests the tech company should approach the Irish government about using Apple products. The information came from Sinn Féin TD Pearse Doherty who received the emails under a Freedom of Information request, and who raised the issue at an Oireachtas committee meeting on Ireland’s corporate tax regime this afternoon. One of the items that we discussed during your visit that I wanted to follow up on, was your suggestion that someone from Apple should approach the Government with a view to improved adoption of Apple’s products within your environment. The mail does not give further details as to exactly what the phrase “improved adoption of Apple’s products within your environment” means. Doherty questioned whether it was usual practice for the Secretary General of the Department to suggest that a company goes to the Government to discuss selling a product. He noted that John Moran had met representatives from the company on other occasions in relation to issues such as ICT and e-government, which he described as “perfectly normal and innocent,” but separate to the issue he was raising. The representatives from the Department of Finance and the Revenue Commissioners responded to Doherty’s questions about the emails but there was no more information about what the outcome of the emails was. 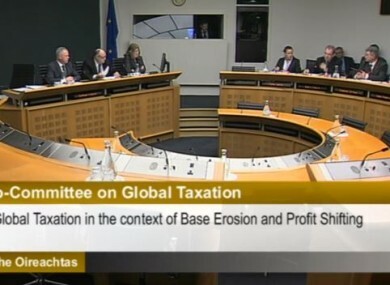 The Oireachtas sub-committee on global taxation met today to discuss the issue of corporation tax, and specifically the recently-announced European Commission preliminary questioning about whether Ireland had a preferential tax rate for certain companies. Both the Department of Finance and the Revenue Commissioners representatives repeatedly stressed that Ireland didn’t strike deals with multinational companies offering a lower rate of corporation tax in return for their locating to Ireland. “Ireland does not do special tax deals,” Gary Tobin of the Department of Finance told the Committee. He stressed that the European Commission request for information was not an investigation and does not automatically mean that an inquiry of any kind is going to be carried out. Gary Tobin of the Department of Finance speaking at the committee today. Email “Questions asked about Apple's relationship with Department of Finance”. Feedback on “Questions asked about Apple's relationship with Department of Finance”.